How is the energy of trees connected to the life of this planet? How does the Divine manifest through trees? How are you connected to life through trees? This path gradually reveals the tapestry of creation, and the healing rhythms that make up the flowing sap of life. Be prepared to be transformed, healed and to find within yourself the deep wisdom of nature. This is the main ritual tool used for this pathworking. The Witch carries it as a staff when walking in the woods, uses it to mark a circle or sets it up as a movable altar. A Stang is a forked ritual staff traditionally only found within the Craft and is usually of Ash wood but could be made of any tree found where you live. It serves as an altar and is a physical representation of the World Tree or Bile (pronounced Bee-lee) known in Norse mythology as Ygdrasil. 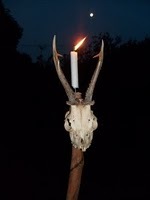 It can also be a staff of office for the Coven Summoner or High Priest and could also represent the Horned God. The Stang is thrust into the ground and decorated to form the altar in the center of the cast circle. If you are doing ritual inside you can put it into a pot of earth. One tree on each “land” (area) or in each forest seems to have more presence or energy than the other trees. It seems more awake, more real. This tree guards the land and holds the magical energy of the land. It communicates with all other trees through its roots. You need to find this tree in the neighbourhood where you live or the wild area where you work magically. This tree can become your ally and guide to the magick of trees. When you find this tree, walk past it often and if you can, spend time sitting under its branches. I once had a Guardian tree growing on someone’s front lawn! Obviously I couldn’t spend time sitting under it, but I tried to walk past it at night or whenever I could. Often I found that the tree had dropped small branches and pinecones onto the sidewalk (for me?) so I picked them up and brought them home. To connect with the Guardian Tree try walking the land in an altered or clear-minded state of consciousness and connecting with the energy of your tree. Make very good notes. How does the energy feel around the tree? How far does that energy extend? Not only do you have to get to know the energy of your land, but also the land has to get to know you. Diana Beresford-Kroeger (2) calls this ‘tree bathing’. (To learn more about her work and how trees can save the world, see the link below.) If you can’t meditate under the tree you can imagine yourself walking to the tree and sitting under it and then meditate as if you were there. When you are ready, introduce yourself to the tree and ask if it will be your ally and guide to the world of tree magic. Trees are very generous but they move at a much slower pace than we do. You may have to wait a while for the answer! It’s also important to research the magickal and medicinal properties of your Guardian Tree. For example: Willow tree is connected with the element of water and the moon. (3)Willow is a healer and Willow bark contains a chemical called salicin that is similar to aspirin. What are the lessons of this tree? When you think you are ready and your relationship with your Guardian tree has been established, create a map of the trees in your area. Usually the center of the map will be the Guardian tree and you walk East, South, West and North in awareness and see how far the energy of the tree extends. Draw a map with your Guardian tree in the center and then identify all the trees around it. This is easier to do in an urban forest but usually trees tend to grow in clumps so you don’t have to draw each individual tree if you are working in a forest. You can ask your Guardian tree to let you know which tree you need to meet next, as if it was introducing you to a friend. When you have identified and researched all the trees in your area, try to spend some time with them and listen to what they have to say to you. All of this work is going to take time and for us Walking People, the Standing People (trees) might seem frustratingly slow! But once you are a friend of the trees, they never forget you! After your introduction to the trees where you live the next step is to learn about the important trees in the world. You can look up Diana Beresford-Kroeger’s list on her blog about trees saving the world (4) or read her book “The Global Forest”. Another way to organize your learning is to use the Celtic Tree Calendar and the Oghams. The Ogham alphabet is a series of strokes cut from a vertical line, each mark corresponding to a letter and a tree. In fact there are many Ogham alphabets and the tree Ogham is only one of them. The tree calendar associates each calendar month with a different tree and corresponding Ogham. (5) Using our Willow Tree for example, the tree is called Saille and the Ogham looks like this a vertical stick with four lines branching off to the right. It is the fourth letter in the tree alphabet. This tree is associated with the fourth Lunar month after the Full Moon closest to Yule. Yes the tree calendar is a lunar and not a solar calendar ; each full moon marks the first day of the new month. Usually Willow month would land around April and would be associated with Beltane. Studying a tree each month, spending time searching for and sitting with that tree and learning its wisdom is a huge part of the Path of the Stang. As with all the other articles in this series, I am only able to give you a small taste of what the spiritual and magical work is like in the Craft. I have been told that the Witches Craft is very old, very new, hidden and secret, easily accessible to all, mysterious spirituality, silly foolishness and so many other conflicting ideas. So where does the truth lie? What the Craft is depends on your perspective and your willingness to open your heart to the Goddess. This includes listening at the knee of the Standing People. I hope you enjoyed these ideas and that your quest is full of adventure and happy synchronicity. 3. Beyerl, Paul. 1998. A Compendium of herbal Magick. Phoenix Publishing, Custer, Washington. pp.357-358. Blamires, Steve. 1997. Celtic Tree Mysteries. Llewellyn Publishing, Woodbury, MN.